The Safeway store at Pacific and Calapooia closed in 1999. It’s not as though residents of Greater Albany have no place to buy groceries. Nobody is wasting away, getting down to skin and bones because there’s nowhere to buy food. Still, people keep wondering about what’s going on with two former supermarkets and one being planned. So I checked. The old West Albany Safeway at Pacific Boulevard and Calapooia Street closed in 1999 even though customers picketed in favor of keeping it open. It’s been empty since then except for an interval as a “dollar store” that didn’t make it. Safeway retained a lease on the building, presumably to keep a competitor from snapping it up. Now the situation has changed. Albany Economic Development Director Kate Porsche told me the Safeway lease was no longer in force and she had been in contact with the owners, the Kampfer Family Limited Partnership in Harrisburg, to see what might be done about finding a tenant for the building. That brings us to the former Ray’s Food Store in North Albany Village. The space has been closed for a couple of years, to the chagrin of North Albany residents who found it a handy place to pick up a few things but didn’t support it in numbers sufficient to keep it going. And finally, WinCo Foods. In May 2015 the company filed a site plan for city review. 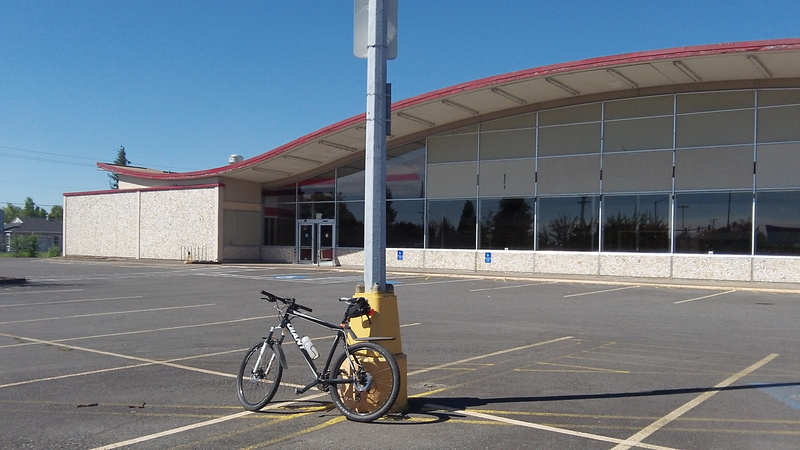 It wants to demolish the former Kmart store at Pacific and Killdeer Avenue, vacant since September 2014, and build a supermarket there. The city needed more information to address infrastructure, transportation and development code standards, according to Melissa Anderson of the planning division. “We have most everything we need now,” Anderson told me today, “but the applicant has indicated they will be submitting a revised site plan early this week. Once we receive that, it is likely we will be able to deem the application complete and send out the notice of filing.” What happens next is that the planning staff will review the plans and sign off on them if all requirements are met. Under the development code, the matter need not go to the planning commission. except for a couple of trivial store-brand items, and get out as quickly as possible so I don’t have to hear their horrible music and advertising. Safeway lost my business many years ago. Why pay more there when you don’t have to. Same with Ray’s. Some of the highest prices in town on the items I buy, consistently. Which is why I run them. The owners of the old Safeway store should take a photo and send it to the regional museum. Then tear the ugly thing down and put up something modern. And do it before the local hysterical folks get involved because they will probably dictate that the ‘flying nun’ is historically significant and must be preserved. There are no arguments that the grocery business is tough. High wholesale pricing and huge inventory requirements make it extra tough for a small independent like Ray’s or even Haggen. I grew up in this part of town and remember shopping both the original and now swoop Safeway building near the canal. I doubt a grocery store can survive in this location even it were updated because the property is just too small. I’m a self-serve gasoline advocate and could envision an ideal “Courtesy Corner” fuel and convenience store location. I would love seeing the Smith family take it on, where their customer service for non self-serve customers could be continued and the service department expanded. One thing I do know, the folks in West Albany would love to have a nice grocery located near them, as would the North Albany people. How this could possibly happen is way beyond my earthly capabilities. I understand that there are plenty of grocery stores in Albany, but they are ALL in The South East of town within walking distance of each other (except for Walmart, which would be a bit long for a walk) and a Winco in the old Kmart would just add to that trend. While West and North Albany are a food desert! When I head home from Corvallis and decide mid-way I want to pick up something for dinner–I have to pass my house, cross the over crowded bridges and go to the other side of town. Come on city planners! It’s not the city planners. The city only provides zoning for sites which tells what general kind of thing can be developed on a parcel (like residential, commercial, industrial, etc.). It’s up to the owners of the land to determine what gets built there, and the free market decides what is successful or not.